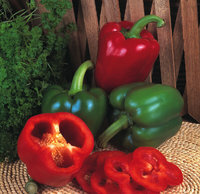 If you can grow tomatoes you can grow versatile and tasty peppers. Try outside in the sunshine in warmer areas otherwise grow under glass. Start by sowing indoors or under glass in March/April and harvest around September time. Start later or harvest earlier if you are growing one of our short season varieties. A well deserved AGM winner, very vigorous and capable of producing prodigious quantities of delicious, slim, bulls horn type peppers that ripen from mid-green to red. The fruits are up to 14cm long while the plant can reach 120cm. Price for 10 seeds. This is a traditional variety and one of the best for roasting. It is a little pepper, heart shaped with really thick, firm sweet flesh. Absolutely gorgeous. If you are not a roast pepper lover this might change your mind, you can always enjoy them fresh for salads! Price for 10 seeds. From Galicia comes this superb pepper. It is more of a conical shape but not as long as a bull’s horn, very pale green and with a lovely almost aromatic flavour. Can be used fresh and is particularly delicious when roasted or grilled. This variety comes from the Basilicata region of southern Italy. Productive low growing plants (to about 60cm) will give you plenty of long slim wrinkly peppers, bright green turning red. They are thin skinned and so are very good for grilling, frying, drying (in fact any general cooking) and also in salads Price for 10 seeds. Sweet and crisp fruits are produced in abundance: from June in a greenhouse, a little later if outdoors. It is not unusual for these to reach 20cm long, and they ripen to a dark glossy red. Mild and refreshing in salads or slice them open and cook. The plants are lofty, they can reach 150cm and you could enjoy upwards of 40 peppers from each. This prolific, early-cropping heirloom has been awarded an AGM. The fruits are medium-sized and as they ripen from dark green to bright red they can resemble a beef tomato. With a good flavour they are perfect for stuffing – try a salad filling for a different summer treat Price for 10 seeds. Named for the wonderful aroma released as you cook these fruits. The smoky fruity flavour adds depth and richness to any dishes that you create with this variety. These are not your typical blocky peppers: they are pendant, sometimes known as crown headed, we think they look like a habanero but with no heat!